Hike/run 30+ miles of trails nearby. Want an easy, paved trail along the river? No problem! Challenging technical trails with tall vistas? No problem! Want to try a trail run? It’s all here! Your destination for Midwestern rock climbing! People in the know come to the St. Croix Valley to test their rock climbing skills. 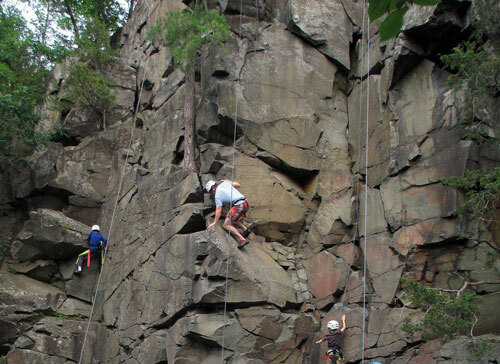 Nearby, Trollhaugen's Aerial Challenge course features all forms of climbing and ends with six adventurous zip lines! St. Croix Falls is the western terminus for this 1,200 -mile footpath. From Interstate Park, the 8-mile St. Croix segment highlights city parks, nature preserves, and the banks of the St. Croix River. Dozens of trails, of all levels of difficulty, traverse the river valley and feature birding, wildflowers, glacial potholes, pine forests, campgrounds, interpretive centers, and more! Get on the green! We have some pretty amazing golf courses in this area if we do say so ourselves. A perfect way to spend a vacation day (or any day for that matter)!